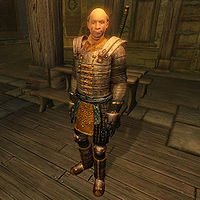 Jauffre is the Breton grandmaster of the Blades, an organization responsible for protecting the Septim Emperors. 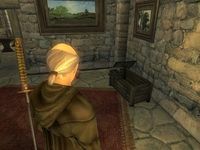 At the start of the main questline, Jauffre can be found living undercover as a monk in Weynon Priory near Chorrol after the events leading to the successful assassination of Emperor Uriel Septim. Once you bring the last Septim heir, Martin Septim, to him during the related quest, Jauffre will relocate to Cloud Ruler Temple and resume his position as grandmaster of the Blades. As a monk, Jauffre wears a monk robe along with stitched leather shoes, and carries an Akaviri Dai-katana, which later confirms his affiliations. When at Cloud Ruler Temple, Jauffre will exchange his monk robes for the uniform of a Blade, consisting of a cuirass, gauntlets, greaves and boots. He also carries around copy of Mixed Unit Tactics and a small amount of gold. Living a life of seclusion as a monk, Jauffre spends the entirety of his days and nights reading in the library situated within Weynon House. His daily schedule will only change once he relocates to Cloud Ruler Temple. Jauffre will then spend the majority of his day patrolling the entire temple. He starts his day off at 8am, patrolling only to take a break at 11.30am within the great hall. at 4pm, he returns to his patrolling until 12.30am, where he will retreat to the east wing for his supper. At around 2am, he takes another two hour break from within the great hall before finally retiring for sleep in the west wing until 8am where he will repeat his schedule. You are sent to him by Baurus at the end of the tutorial. This marks the start of the main quest, in which he plays a major role. He is respected by his fellow Blades, particularly at Weynon Priory, as Brother Piner claims: "We are honored to have Grandmaster Jauffre, or Brother Jauffre as he prefers, as a resident here." During the tutorial, the Emperor will ask you to bring him the Amulet of Kings. Baurus will explain: "He's the Grandmaster of the Blades. As the eyes and ears of the Emperor, the Blades don't advertise themselves. We of the Imperial Bodyguard are the public face of the Blades, but most of my brothers serve the Emperor quietly, behind the scenes. You'll find Grandmaster Jauffre at Weynon Priory, living as a simple monk." and "Although you may not think so to meet him. He lives quietly as a monk at Weynon Priory, near the city of Chorrol." If Baurus died, and you have his sword, he will honor the fallen knight: "He will not be forgotten. He goes to Aetherius to join the other fallen heroes of the Blades. I thank you for recovering his sword. I will set it in a place of honor in the Great Hall of Cloud Ruler Temple." Asking about Baurus again, or when you simply haven't got his sword, he will say: "He served with honor. No Blade could ask for higher praise." When the Emperor is assassinated, he gave you the Amulet of Kings along with his final words which leads you to travel to Weynon Priory situated near Chorrol and to give the amulet to a man named Jauffre. You can usually find Jauffre on the second floor of the priory itself, reading the book Mixed Unit Tactics which he carries around on him. When approaching him, he will be rather direct and say: "I'm Brother Jauffre. What do you want?" Once you've given him the amulet, you may ask him who the 'Prince of Destruction' is, in which he will reply: "The Prince of Destruction he referred to is none other than Mehrunes Dagon, one of the lords of the demonic world of Oblivion. The Emperor's words-- "Close shut the jaws of Oblivion"-- certainly suggest that he perceived some threat from Oblivion. But all the scholars agree that the mortal world is protected from the daedra of Oblivion by magical barriers." If you ask how Oblivion is a threat, he will elaborate: "I'm not sure. Only the Emperors truly understand the meaning behind the rituals of coronation. The Amulet of Kings is ancient. Saint Alessia herself received it from the gods. It is a holy relic of great power. When an Emperor is crowned, he uses the Amulet to light the Dragonfires at the Temple of the One in the Imperial City. With the Emperor dead and no new heir crowned, the Dragonfires in the Temple will be dark, for the first time in centuries. It may be that the Dragonfires protected us from a threat that only the Emperor was aware of." Telling him that he asked for you to find his son, Jauffre will elaborate his knowledge: "I am one of the few who know of his existence. Many years ago, I served as captain of Uriel's bodyguards, the Blades. One night Uriel called me in to his private chambers. A baby boy lay sleeping in a basket. Uriel told me to deliver him somewhere safe. He never told me anything else about the baby, but I knew it was his son. From time to time he would ask about the child's progress. Now, it seems that this illegitimate son is the heir to the Septim Throne. If he yet lives." Also asking where you may find him, he will inform you on his whereabouts: "His name is Martin. 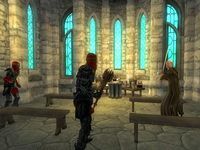 He serves Akatosh in the Chapel in the city of Kvatch, south of here. You must go to Kvatch and find him at once. If the enemy is aware of his existence, as seems likely, he is in terrible danger. And please, let me know if there's anything you need. My resources here are limited, but I will help in any way I can." If you have already visited Kvatch, he will instead tell you: "His name is Martin. He is a priest in the Chapel of Akatosh in Kvatch. Yes, Kvatch. I cannot believe that the attack on Kvatch is a coincidence. The enemy seem to know all our secrets. You must return to Kvatch at once, and rescue Martin if he lives. There is no time to lose! If there's anything you need, please ask. My resources here are limited, but I will help in any way I can." This conversation will start Find the Heir, and now you can ask for more information on several topics. When you ask him about the Amulet of Kings, he will reassure its safety: "It will be safest here with me. When you return with Martin, we will figure out our next move." When you ask him about Baurus, he will be glad of his survival: "One of the youngest Blades ever to serve in the Emperor's personal guard. I am glad to hear that he survived, but I fear he will take the Emperor's death particularly hard." When you bring up the Blades, he will explain: "Yes, Baurus told you right. I am the Grandmaster of the Blades. We serve the Emperor and the Septim bloodline. Talos is our patron. You wonder to find me here? Discretion is our watchword. Only a few of us have the honor to serve publicly in the Imperial Guard." When you ask him about the Dragonfires, he will explain: "The coronation of each new Emperor is sealed when he uses the Amulet of Kings to light the Dragonfires in the Temple of the One. The Dragonfires of Akatosh remain lit until the death of the Emperor. His successor then lights them anew upon ascending to the throne. With Emperor Uriel dead and no successor crowned, the Temple of the One will be dark for the first time in centuries." 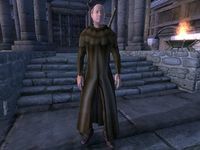 When you ask about Martin, he won't have much more to say: "He is a priest in the Chapel of Akatosh in Kvatch. He never knew that he was Uriel Septim's son. You need to find him at once and bring him safely back here." He will also give more information on Mehrunes Dagon, should you ask him: "The daedra Prince of Destruction. An inveterate foe of all mortal races. He was involved with Jagar Tharn's plot against the empire years ago. It doesn't surprise me to find his hand in the current calamity." If you ask for assistance, however, he will tell you about his supplies: "I keep a few things here in my chest to resupply traveling Blades. Help yourself to whatever you need. ", after which he will get up from his chair, walk to the chest and unlock it, granting you access to weapons, armor, potions, a scroll, but most importantly, a chest that doesn't respawn, so feel free to store any items in there. If you ask for assistance again, he will explain: "I don't have much here at hand, but you're welcome to anything you need from my chest in the reading room. Prior Maborel and Brother Piner may also be able to help. You should speak to them about it if you haven't already." When you terminate the conversation, he will stress the importance of Martin's safety: "Waste no time. You must find Martin before the enemy does." If you re-enter conversation, he will do the same: "Your first priority now should be to find Martin and bring him back here." Upon arriving at Weynon Priory with Martin, you will find it is being attacked, starting the quest Weynon Priory. When you've helped Jauffre defeat the attackers in the chapel, he will be relieved: "You're back. Thank Talos! They attacked without warning. I was praying in the Chapel when I heard Prior Maborel shout. I had just time to arm myself. The Amulet of Kings! I fear that was the target of this attack. I kept it in a secret room in Weynon House. We need to go see if it is safe." When you tell him you'll check on the amulet, he will say: "We'll go together. But I fear the worst. ", after which he will run to the Priory House. If you manage to enter conversation with him, he will say: "The Amulet ... is it safe?" Asking about the Amulet of Kings at that point, he will explain: "I fear that the Amulet was the target of this attack. Go and see if it is safe!" When he has checked the room, he will tell you the grave news: "They've taken it! The Amulet of Kings is gone! The enemy has defeated us at every turn!" When you point out that you've secured Martin's safety, he will be thankful: "So it has not all gone against us. Thank Talos for that! We gained Uriel's heir, and lost the Amulet of Kings. Martin cannot stay here. We have driven them off, but they will be back once they learn of Martin's survival. Which they will." When you ask him where Martin will be safe, he will tell you about the sanctuary of the Blades: "Nowhere is truly safe against the power arrayed against us. But we must play for time, at least... Cloud Ruler Temple, I think. The hidden fortress of the Blades, in the mountains near Bruma. A few men can hold it against an army. We should leave at once." At this point, you can ask for some additional information. You can ask about the Amulet of Kings: "With the Amulet taken by the enemy, we must get Martin to safety at Cloud Ruler Temple." When you ask him about Cloud Ruler Temple, he will explain: "Cloud Ruler Temple was built long ago, by the founders of the Blades, back in the days of Reman Cyrodiil." Upon terminating the conversation, he will express his concern: "We should get moving. I won't rest easy until Martin is safe at Cloud Ruler Temple." If you re-enter conversation, he will do the same: "We have to get Martin to the Temple of the One or Mehrunes Dagon has won after all." After Martin's speech at Cloud Ruler Temple, he will tell you to speak to Jauffre about recovering the Amulet of Kings, starting The Path of Dawn. When you go talk to Jauffre, however, he will start by thanking you and offering a position as a Blade: "You have proven yourself a loyal servant of the Empire, as worthy as any of the Blades to stand by Martin's side during this crisis. As the Grandmaster of the Blades, I would be honored to accept you into our order. Will you join us?" You can ask him what the duties of the Blades are: "The Blades are sworn to the service of the Emperor, as the mortal representative of the Dragon Blood of the divine Talos." If you decline his offer, he will respect your decision: "Very well. Many serve the Empire in their own way. But we would be honored to have you, if you change your mind." If you agree, however, he will give you an Akaviri katana: "It is my honor to welcome you into our ranks as a Knight Brother/Sister of the Blades." The next time you greet him, he will express his fondness over Cloud Ruler Temple: "It is good to be back here. It raises my spirits just to walk these ancient halls again. We will prevail. We must prevail!" If you mention the Amulet of Kings, he will agree it must be retrieved: "You're right. We must try to recover the Amulet before the enemy takes it out of our reach. You should go back to the Imperial City. Baurus may have learned something about the assassins. You'll find Baurus at Luther Broad's Boarding House in the Elven Gardens district of the Imperial City." Asking about the amulet again, he will stress its importance: "The Amulet of Kings is the key to everything now. Once we have it back, Martin can use it to light the Dragonfires in the Temple of the One, and reseal the barriers between Oblivion and our world." You can also ask about Cloud Ruler Temple at the spot: "This place was built by Reman Cyrodiil's Akaviri Dragonguard, at the founding of the Second Empire. Since then, it has served the Blades as a headquarters, fortress, and sanctuary. We can protect Martin here until you recover the Amulet of Kings." When you ask about the Blades, he will tell you about the armory: "This fortress is well-supplied with arms and armor. Use what you need from the armory in the east wing." When you've talked to Baurus, Jauffre will be equipped with a Blades cuirass, Blades greaves, Blades boots and Blades gauntlets. If Baurus survived the quest, he will be present at Cloud Ruler Temple. Jauffre will be pleased with his presence: "I'm glad to have Baurus here. He guards Martin night and day. His way of atoning for the death of Emperor Uriel, I suppose." During Dagon Shrine, when you've found out where the shrine is, he will be pleased, should you go greet him at Cloud Ruler Temple: "Good work locating the Shrine of Dagon. If you can retrieve the Amulet of Kings, we may yet prevail." If Mankar Camoran escaped to his realm, and should you leave to Cloud Ruler Temple without retrieving the Mysterium Xarxes, he will point out: "You need to get the Mysterium Xarxes from the Mythic Dawn's Shrine of Dagon. It is our only hope to retrieve the Amulet of Kings." After having recovered the Mysterium Xarxes, Jauffre hopes you've recovered the Amulet of Kings: "Thank Talos you've returned safely! Do you have the Amulet?" When you tell him Mankar Camoran escaped with it, he will fear the worst: "Please tell me you have some good news..." When you tell him you've got the book, he will be relieved: "Ah. Good. You should take that to Martin right away. He'll be in the Great Hall, reading. He's hardly taken time to sleep since you left. ", after which the conversation ends. After having given the Mysterium Xarxes to Martin, Jauffre will express his concern upon greeting you: "I hope Martin knows what he's doing with that evil book. I fear for what it could do to him if he's not careful." Martin will have told you to ask Jauffre about spies in Bruma, which started Spies, and when you do, he will explain: "Ah, yes. I hope you can help. The gate guards have reported seeing strangers on the road for the past several nights. I cannot leave Cloud Ruler undefended while my men search the whole mountainside, but these spies must be eliminated." When you tell him you'll find the spies, he will be thankful and tell you what to do: "Thank you. Talk to Steffan. He can tell you where he has seen them. Captain Burd in Bruma may also be able to help. I've asked the Countess to have the guard keep an eye out for strangers. Track down the spies and kill them. Find out what they know, and what they're plannning [sic], if possible." At this point, whenever you enter conversation, he will ask you about your progress: "What have you learned about the spies?" When you have nothing to report, he will stay concerned about the matter: "Very well. Keep looking. We must uncover those spies and find out what they know." 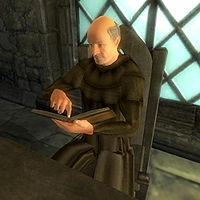 If you discovered Jearl's Orders without having eliminated the spies, he will be angered about the Mythic Dawn's discovery: "This makes for grim reading. The Mythic Dawn did not take long to locate Martin again. The document speaks of two agents. You need to eliminate both of them." If you return without having made further progress, he will be slightly irritated: "You must eliminate both the Mythic Dawn agents in Bruma. We cannot allow them to continue to plot against us." When you tell him one of the spies has been killed, he will be pleased: "Good. But there may still be more spies out there. You should continue to search for their base of operations in Bruma." If both agents have been killed, but you haven't found Jearl's Orders, he will point out you must be sure there aren't any more spies: "Good work. But you must locate their base and make sure you've eliminated all of them." When both Jearl and Saveri Faram have been killed, and you've found their orders, he will commend your achievements: "Excellent work. I knew I could count on you. The gods did not idly choose you as their agent, whatever you may think. But we have not eliminated the threat against Bruma and Cloud Ruler Temple, only delayed it. I will warn the Countess of the danger. You should speak to Martin. I believe he has made some progress with the Mysterium Xarxes." After having given a Daedric artifact, acquired from one of the Daedric Quests, Martin will point out that Jauffre helped him out, starting Blood of the Divines: "[...] How then to obtain the blood of a god? But Jauffre solved it. The blood of Tiber Septim himself, who became one of the Divines. This is a secret remembered only by the Blades, passed down from one Grandmaster to the next. Jauffre should tell it to you himself." Which he will, as you greet him: "So, Martin wants you to recover the Armor of Tiber Septim? I wish there was another way. The Armor is in the Shrine of Tiber Septim, in the catacombs beneath the ruins of Sancre Tor. A holy place, once. But Sancre Tor became evil long ago. No one has returned from the Shrine of Tiber Septim for many lifetimes." When you ask him about this evil, he will explain: "I do not know. The catacombs of Sancre Tor were sealed by the first Grandmaster of the Blades. The four mightiest Blades of Tiber Septim's day, Alain, Valdemar, Rielus, and Casnar, went to Sancre Tor and never returned. Here, this is the key to Sancre Tor's outer door. I fear I am sending you to your death, but we have no other choice. You must succeed." You can ask for more information about the Armor of Tiber Septim: "An ancient relic of the first Emperor, who became the divine Talos, the patron of our Order. After the Battle of Sancre Tor, Tiber Septim gave his armor to the Blades in honor of our role in his victory. The Blades built a shrine in the catacombs of Sancre Tor, on the spot where Tiber Septim received the blessing of Akatosh. The Armor has been there ever since. Before evil came to Sancre Tor, this shrine was a place of pilgrimage for all Blades. But no one has visited the shrine and lived to tell the tale in centuries." The first time you engage in conversation after he's told you about the Armor of Tiber Septim, he will express his concern over Martin: "I'm worried about Martin. He does nothing but pore over that evil book all day." Otherwise, he will say: "Have you recovered the Armor of Tiber Septim yet? We need to open the gate to Camoran's Paradise as soon as Martin deciphers the whole ritual." After having recovered the Armor of Tiber Septim, he will admire your achievement: "You have earned a place of honor in the rolls of our Order for recovering the holy relic." "I've just received word from the Countess of Bruma that an Oblivion Gate has opened outside the city. 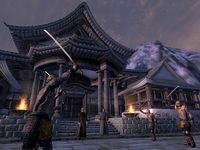 It seems that the Mythic Dawn are putting their plan to attack Bruma into motion." After having given the Armor of Tiber Septim to Martin, he will tell you Jauffre needs to speak to you, starting Bruma Gate. Upon greeting you, Jauffre will explain: "I've just received word from the Countess of Bruma that an Oblivion Gate has opened outside the city. It seems that the Mythic Dawn are putting their plan to attack Bruma into motion. Since you've dealt with these Gates before, I'd like you to help the Countess's guard close this gate. Once they've seen how it's done, they should be able to handle any new gates on their own." When you ask him where the gate is, he will refer you to Burd you: "Captain Burd is waiting for you outside the Bruma city gate. He'll show you the Oblivion Gate. Although I doubt it will be hard to find." After that, greeting him will make him point out the matter: "Don't forget, Captain Burd needs your help to close the Oblivion Gate outside of Bruma." When you've closed the gate, talking to Jauffre will trigger Allies for Bruma: "Good work. Captain Burd and his guardsmen should be able to handle any additional Gates, at least for now. But the Bruma Guard cannot defend the city indefinitely. The daedra of Oblivion are innumerable; the guardsmen of Bruma are not. We need to gather what allies we can before Bruma is hopelessly besieged. If the Mythic Dawn manages to open a Great Gate here, the city will need a stronger garrison for there to be any hope of defending it. You should speak to the rulers of the other cities of Cyrodiil, as well as the Elder Council. Ask them to send aid to Bruma before it is too late." When you ask him what else you can do, and you haven't yet started Blood of the Divines, he'll say: "Martin made some progress on the Mysterium Xarxes while you were gone. You should speak to him about it." Otherwise he'll say: "Keep working on obtaining the items Martin needs for the ritual. Everything else is just buying time for us to get the Amulet of Kings back from Mankar Camoran." "Bruma cannot hold off the hordes of Oblivion alone. You should ask the rulers of the other cities of Cyrodiil to send help." When you ask about aid for Bruma, he will explain: "Bruma cannot hold off the hordes of Oblivion alone. You should ask the rulers of the other cities of Cyrodiil to send help." If you gained one ally, he will be angered by the quantity: "I had hoped for more help. The Empire will stand or fall with Bruma! Have all the other cities abandoned us?" With less than four cities' aid, he is not satisfied yet: "Your efforts are starting to pay off. Just knowing we do not stand alone has raised the morale of the Bruma Guard. But I still fear that Bruma will fall before you can complete the ritual. You need to buy Martin more time. Bruma needs more help!" With less than seven, he will be pleased: "You've done well. The Bruma garrison is much stronger now. We should be able to put up a good fight even against a determined assault. I hope it is enough. Bruma must hold out until you can complete the ritual and retrieve the Amulet from Mankar Camoran." With all the cities' support, he will be happy: "You've done better than I had hoped. Bruma's garrison is now as strong as we can make it." He will also give more information about the Elder Council, should you seek it: "The Elder Council rules in the Emperor's absence, by ancient tradition. Chancellor Ocato heads the Elder Council and is the closest thing the Empire has to a leader right now. But the Blades answer only to the Emperor, of course. We are not an arm of the government." After having retrieved the Great Welkynd Stone and returning to Martin, you will hear Jauffre and Martin having a discussion. If you ask about the battle plans, Jauffre will say: "Martin has made his decision. The Blades stand beside him." When you've talked to Martin, Jauffre will be equipped with a Blades helmet. When you told Countess Narina Carvain you're ready for battle, Jauffre will express the importance of Martin's survival during the battle: "We must protect Martin during the battle. He is the Empire's last hope." At this point, Jauffre plays much less of a major role in the main quest. At the start of the battle, he permanently loses his essential status. The following dialogue will therefore, obviously, only be available when Jauffre survives. When you've closed the Great Gate, he will congratulate you upon greeting you: "You should be proud of what you did here today, but remember, the war is not yet over. Until you reclaim the Amulet and Martin lights the Dragonfires, the enemy will not be truly defeated." "Don't give the enemy a chance to recover from their defeat." When you've talked to Martin after closing the Great Gate, Jauffre will express the importance of recovering the Amulet of Kings as fast as possible: "Once you're rested and equipped, you should have Martin open the portal to Camoran's Paradise immediately. Don't give the enemy a chance to recover from their defeat." When Martin has opened the portal, talking to Jauffre will anger him: "You must enter the portal to Camoran's Paradise and reclaim the Amulet of Kings!" When you return with the Amulet of Kings, Jauffre will be overjoyed: "You've done it! Victory is within our grasp! Give the Amulet to Martin at once!" "Time is pressing. Martin must relight the Dragonfires before the enemy can stop us." 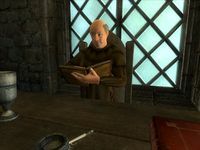 When you've given the Amulet of Kings to Martin, Jauffre will tell you about the Dragonfires, should you ask it: "Once Martin uses the Amulet of Kings to light the Dragonfires, the barriers between Oblivion and Tamriel will be restored. The Oblivion Gates will close, and Mehrunes Dagon's invasion will have failed." At that point, asking about the Elder Council, he will express his concern over the Empire: "Martin is right. Declaring oneself Emperor is a delicate matter. In this case, however, I do not think there should be any dispute. The Elder Council has been governing the Empire since the Emperor's murder. They will be overjoyed to have an heir to crown. They've been unable to solve the Oblivion Crisis. The Empire is falling apart. Only a legitimate Emperor offers any hope." When you've reached the Elder Council Chambers, greeting Jauffre will reveal his concern over the timing: "Time is pressing. Martin must relight the Dragonfires before the enemy can stop us." 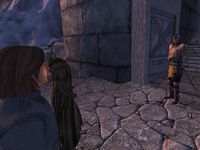 After finding out the Imperial City is under attack, greeting Jauffre will reveal his fear: "We have to get Martin to the Temple of the One or Mehrunes Dagon has won after all." When you've seen Mehrunes Dagon in the flesh, upon greeting Jauffre, he will courageously comment: "I hope Martin knows what to do now. I will die by his side, if this is the end." After the defeat of Mehrunes Dagon, the first time you greet Jauffre, he will be astonished: "A victory beyond hope! You and Martin defeated Mehrunes Dagon in the very moment of his triumph! All hail the Champion of Tamriel!" When you ask him about the Dragonfires, he will explain: "I believe that Martin's sacrifice sealed the gates of Oblivion forever. Tamriel no longer needs the protection of the Dragonfires." Asking about Martin, he will express his admiration: "He truly was the Dragonborn... the last, and perhaps the greatest of all the Septims." He will also comment on Mehrunes Dagon: "Against all hope, Martin cast him back into Oblivion! He will not trouble our world for long years to come." When he's at Cloud Ruler Temple, asking about it will express his concern over the Empire: "This old place is the one thing that gives me some sense of certainty in these uncertain times." After this, he may greet you with: "What can I do for you, Savior of Tamriel?" During the Weynon Priory quest, Jauffre can be a useful follower because he is an essential NPC with good combat skills. However, during Light the Dragonfires he is less useful because he is no longer essential. He has some voice files voiced by Wes Johnson, the voice for male Imperials. On his death, a new sword is added to the wall about the fireplace in Cloud Ruler Temple. "To prove he is the true heir, an emperor must first light the dragonfires in the Temple of the One in the Imperial City. Only the true heir can light the dragonfires, and if he has the Amulet of Kings. Akatosh, the Supreme God of Time, gave the Amulet of Kings to St. Alessia, the first emperor, as a god-certain test of the true heir. The Great God of All made a covenant with St. Alessia. So long as a true heir ruled the Empire, the Great God swore to protect the Empire. The very foundation of the Empire is the bond between god and emperor. That a false heir might be crowned... that the test of the Great God might have failed... My heart fails me. It is unthinkable." "I should have known they could find it. Little can remain hid from a Daedra Lord. I underestimated the enemy. It will not happen again. What of your mission to Kvatch?" "I am glad to hear that he survived. A small bit of good news in these dark times. But he will take the Emperor's death very hard." As with numerous other NPCs, Jauffre cannot be influenced through the Speechcraft minigame. Sometimes when talking to the Countess during Defense of Bruma Jauffre assaults the player and sometimes he himself ends up dead, from being attacked by Martin and the guards. ? Upon arriving at Cloud Ruler Temple he may never ask you if you want to join The Blades. Jauffre may never equip his Blades Armor, leaving him weak and making him look strange when he wears his helmet without armor. ? If Jauffre dies, for example during Defense of Bruma, his body will never disappear because it is tagged as a "Quest Item". This page was last modified on 4 September 2018, at 01:25.